IAWN released this image to show the latest estimated risk corridor of the fragment of 2015 PDC that is on a possible collision course with the Earth. The corridor is long because the fragment received an unknown amount of deflection. If the fragment received essentially no deflection, it would impact in the South China Sea, where the original asteroid was headed. 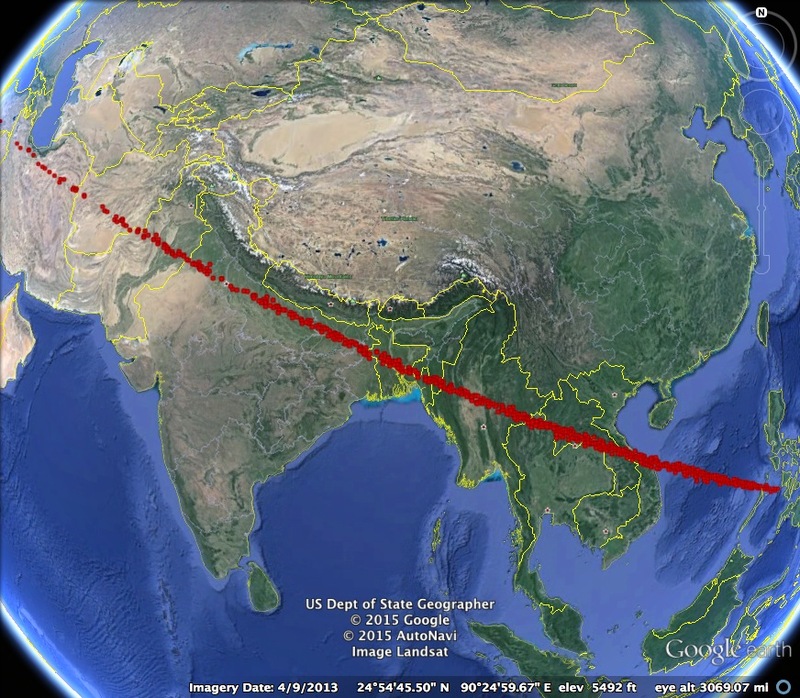 If the fragment received some deflection, it could impact somewhere along a corridor extending from Vietnam, Laos, Thailand, Myanmar, Bangladesh, India, Afghanistan, Pakistan, Iran, Iraq and Turkey. If it received a deflection delta-v larger than about 20 mm/s, the fragment would miss the Earth entirely. Approach images taken just before the leading KI spacecraft impacted 2015 PDC revealed that the asteroid looks much like elongated asteroid Itokawa, but only about 300 meters in length. The first KI mission imparted its velocity change successfully, but it also fractured the body. The second KI spacecraft successfully impacted the asteroid, but a loosely connected fragment split off without receiving much deflection. The third and fourth kinetic impactors hit the main part of the asteroid, delivering the final velocity change needed to move the main asteroid away from Earth impact, but they did not affect the fragment. Of the two other KI spacecraft, one failed on launch and the other missed the asteroid entirely. The Indian flyby observer spacecraft imaged the asteroid two days after the final KI impact and detected both the asteroid and a sizeable fragment within the cloud of debris. The spacecraft lost attitude control near closest approach due to impacts from debris particles, and only the approach images captured the fragment. Because of the attitude failure, it was not possible to determine the deflection delta-v imparted to the fragment, but it was clear that the fragment had not received much deflection. The smaller fragment of 2015 PDC was estimated from the approach images to be 80 +/- 20 meters in size, or roughly 60 to 100 meters. The deflection could not be imaged directly from the ground because the asteroid was too close to the Sun, and the solar elongation was only getting worse. Finally, in Nov. 2020, ground-based observations of the asteroid resumed. Two distinct objects were barely resolved. The small fragment has been observed for two months now, and IAWN announces today that its deflection can only barely be determined from the tracking data. IAWN estimated the probability that the fragment could impact the Earth was 54%.